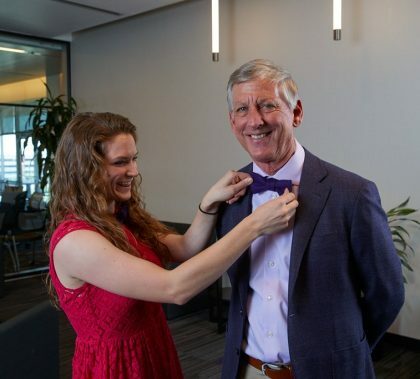 Photos by David Kadlubowski GCU News Bureau GCU alumna Andrea Northup outfits President Brian Mueller and other executives with bowties she made to help the the Lakota American Indians in South Dakota. Students and staff came together Wednesday night to enjoy a night of salsa dancing, music and food just outside of the College of Humanities and Social Sciences. Hand in hand and paso a paso (step by step) students smiled, laughed, turned and showed off their dance moves. GCU Public Safety officers Danny Ryan (left) and Enrique Pallares aren’t about to let anyone abscond with the Golden Turkey Trophy the Peoria office proudly displays in its lobby. Peoria has raised the most money in turkeys and cash for the University’s Battle of the Turkeys to benefit the Big Give Turkey Drive for the Salvation Army for the past four years, and the folks there are going for a fifth. They’ve issued a challenged to fellow Lopes on the main campus and other office sites to just try to beat them. Turkeys/cash are due at noon Tuesday.